"I'm Commander Shepard, and this is my favorite deodorant on the Citadel." Old Spice clearly listened to the fan critics who said that Mass Effect 3 should have ended with its main character wielding a pair of nunchucks while riding a Rastafarian raptor. One of its newest line of online advertisements features a carbon copy of the character as part of an elaborate prank website. What appears to be a simple website selling flavored soul patch powder quickly turns into Isiah "Old Spice Guy" Mustafa chiding viewers for their terrible taste in facial hair. The video ends with a "visual representation" of how Old Spice will make you smell, which is apparently a Commander Shepard lookalike mounting the Raptorfarian while brandishing a pair of nunchucks. The Mass Effect-inspired ad is part of a new online marketing campaign by Old Spice called "Interneterventions" and all follow the basic formula of offering a fake "manly" product and then Mustafa showing up to set the viewer straight. Other videos in the series include a coupon for getting a barbed wire tattoo half off with purchase of a tribal tattoo and "Brodos," condos built inside of gyms. 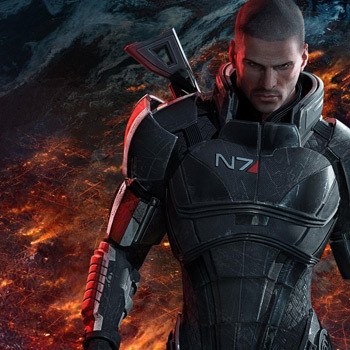 And while the N7 hero riding his trusty dinosaur steed into battle would have made for one heck of a scene in Mass Effect's finale, its probably not in the recent 539 page fan rewrite of Mass Effect 3 that was recently made public.